Stovt: Bryggeriloggen 08: Crime & Punishment Brewing Co.
Bryggeriloggen 08: Crime & Punishment Brewing Co.
Det er Crime & Punishment Brewing Co., der ligger navn til kassettebåndsselskabet Crime & Punishment Packaged Goods, som er blevet nævnt et par gange i denne uge. Det Philadelphiabaserede bryggeri åbnede i midten af juli, og den ene af de mange bagmænd; Michael Wambolt, har været så venlig, at besvare spørgsmålene til Stovts bryggerilog. 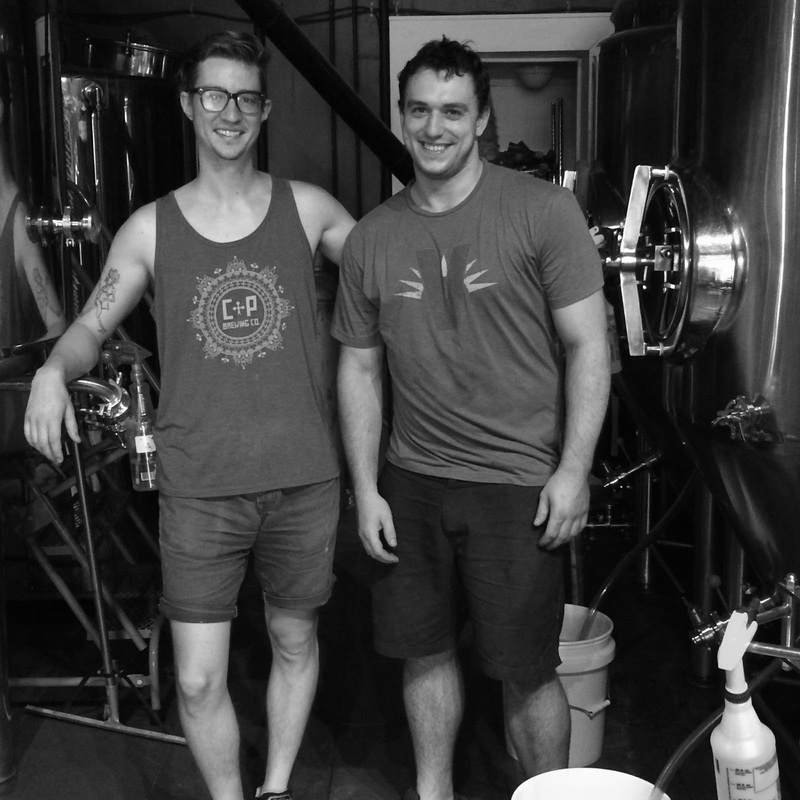 Michael Wambolt og Crime & Punishment Brewing Co.'s anden brygger Mike Paul. Real brewery or "contract brewery"? Crime and Punishment has been a moniker of the beers I have homebrewed for the past five years. The name comes the Fyodor Dostoevsky novel, which I was reading at the time I came up with the idea. I've been serving my beers to friends locally over the past several years, and have toyed with the idea of opening a brewery a few times. Eventually it dawned on me that Brewerytown didn't have a brewery, and I could be one of the people who help bring it back. After talking with friends over the next several months I was able to find some awesome partners who were willing to invest their time, energy, and money to get Crime and Punishment off the ground and in Brewerytown. My interest in Brewerytown began in 2010 when I moved to 26th and Girard. Back then I don't even remember calling it Brewerytown. I'm pretty sure I referred to it as Fairmount, or the Art Museum Area, or I live near the Zoo kind of. I moved around a bunch trying to find cheap rent and landed at 30th and Flora Streets in 2011 lived there for a year and found myself back in Brewerytown again in August of 2013 when my wife and I bought our first house here on Corlies Street. I love brewing beer so it makes sense that Brewerytown kept calling me back. Well beyond that, the neighborhood's current evolving dynamic is one that intrigued me. I like to put myself in places where I know I can grow as a human being and Brewerytown presented that to me in the challenge of establishing both a life and a brewery here that appreciates and involves itself with the history and culture both in the past, present and future of Brewerytown. The first Lager yeast in America was brought here too, and that's really cool! This neighborhood was home to over 20 breweries before prohibition, it was a beer Mecca! Crime and Punishment wants to carry the torch that really never recovered after Prohibtion even if it's as small as 3 barrels at a time! We hope to expand the brewery over time, but not in any dramatic levels. Our next goals are to get some more fermenters and start distributing our beer throughout Philadelphia, and perhaps eventually take over the 2nd and 3rd floor apartments above the brewery for extra seating and space. What kind of beers should we expect? Our goal is to definitely brew beer for everybody. We have incredibly simple styles like an American Blonde Ale and Pale Ales, but we also do a lot hop forward IPAs and Farmhouses. We Also have 2 kettle soured beer currently available. They are a Raspberry Berlinerweisse and a Grodziskie. We like to brew seasonally as well, so in the colder months we will have some Stouts and Porters, and obviously a Russian Imperial stout (keeping in theme with the Crime and Punishment novel). In the short term we would simply like to continue to spread the word of our beers throughout the area. We will be starting a series of First Friday events with other local businesses along Girard Avenue that I'm really excited about that involve local artists, DJs, and musicians.